Let’s start with the stop-press. I went to a gig last night and thought the sound was good. Yes, that’s right. I have no complaints about the sound whatsoever. It was loud and full and rich and present, but controlled and not at all harsh, despite the volume. My ears were ringing only slightly immediately after the show last night, and not at all by this morning. Happily the show was every bit as good as the sound mix. 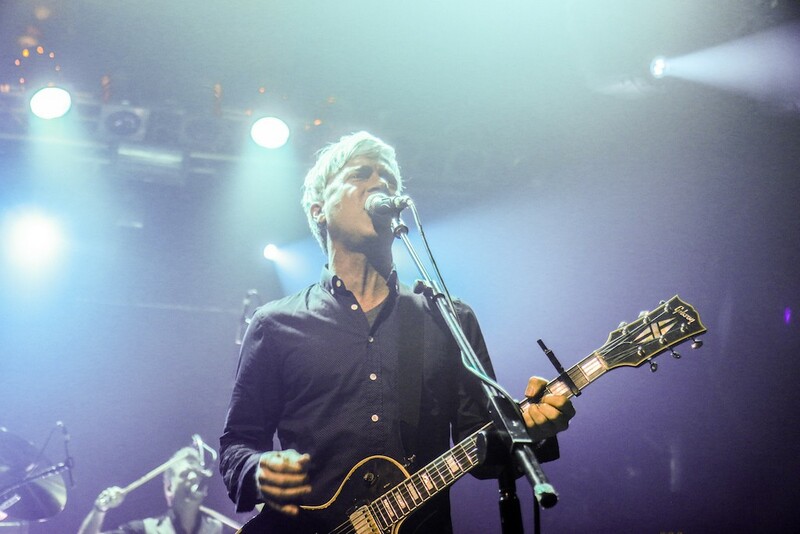 Nada Surf’s thing – tightly written songs, vocal harmonies, guitars at that sweet spot halfway between jangly and crunchy – is not the most complicated thing in the world, but nonetheless they make it look so incredibly easy. All four members are very capable musicians. All of them pitch in with harmonies. Whatever tempo they’re played at, songs are dispatched without fuss, one after the other: bang, bang, bang. 18 songs in the set, four more in the encore, and a couple of acoustic singalongs by the merch table afterwards. Not much more than 90 minutes from first note to last. Guitarist Doug Gillard, formerly of Guided By Voices, added unshowy lead guitar and when he and Matthew Caws struck up the chiming harmonised intro of Jules & Jim, it was total Big Star-in-1972 jangle-pop heaven. The set contained a good mix of material. New album You Know Who You Are is a bit of a grower, and a more than decent addition to their canon, but they didn’t go too hard after the new material, instead blending it in with established favourites. They opened with Cold to See Clear, but otherwise limited the new songs to the lovely Believe You’re Mine, Friend Hospital (repository of a couple of Caws’s dafter lyrics), Animal and Out of the Dark. Those aside, the songs were drawn more or less equally from Lucky, Let Go and The Weight is a Gift. Personal highlights for me were Weightless (also a favourite of Mel’s), which saw the band switching impressively between its 12/8 main section and slow 4/4 passages, the aforementioned Believe You’re Mine and Jules & Jim, See These Bones (also a highlight of the Islington show – as Sara remarked to me, though, Caws is now telling the story of his visit to the Capucin monks’ ossuary in Rome as if he’s getting a bit tired of it), What Is Your Secret, Do It Again (cool bass riff, and massive cymbal-smashing awesomeness in the choruses) and Concrete Bed, essayed in the band’s trademark no-fuss style. Nada Surf are a band I could see play many more times without getting bored. They’re so damn good at what they do, and I like what they do very much. This entry was posted in Music and tagged 1990s, 2000s, alternative rock, Animal, Believe You're Mine, Big Star, Capucin monks, Cold to See Clear, Concrete Bed, Do It Again, Doug Gillard, Electric Ballroom, Friend Hospital, gig review, Guided by Voices, guitars, indie, indie rock, Ira Elliot, jangle-pop, Jules & Jim, Let Go, live gigs, Lucky, Matthew Caws, Nada Surf Electric Ballroom, Nada Surf gig review, Nada Surf live review, Out of the Dark, Posies, See These Bones, The Stars are Indifferent to Astronomy, What Is Your Secret on April 12, 2016 by rossjpalmer.